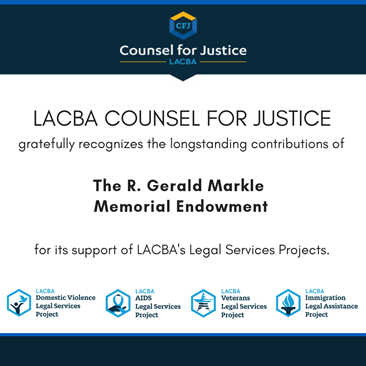 LACBA Counsel for Justice gratefully acknowledges The R. Gerald Markle Memorial Endowment for its support of CFJ and LACBA’s Legal Services Projects. The Endowment has donated more than $18,000 to support LACBA’S pro bono projects since it was established 14 years ago by Ellen A. Pansky. Counsel for Justice brings together law firms, foundations, corporations, donors and volunteers in support of a more just LA. Together, we stand at the forefront of providing equal access to legal services in our community by raising funds and directly contributing at the frontlines of justice in four key areas: domestic violence, support of our veterans, immigration assistance and AIDS services. With over 50 years of service as the charitable arm of the Los Angeles County Bar Association, our efforts have raised millions of dollars in giving and impacted hundreds of thousands of lives with better, more powerful paths to justice.